Every company has its strengths and areas for improvement; and it is HC professionals’ detailed analysis and skills on which the goals to be pursued and the actions to be taken in HCM depend, so as to maximize the business benefits from it. A focus on advantages as well as a good knowledge and clear vision of how to tackle problem areas are fundamental to gaining a competitive advantage. Texts in brackets such as ‘not shown on chart’ or ‘data about other HC indicators required’ are an example that in most cases when data are analyzed we need additional metrics like total profit, profit per employee, comparisons with companies from similar industries operating abroad, personnel costs breakdown by department or activity, sales force efficiency, level of employee engagement, etc. The indicators I have discussed are in one way or another related to remuneration management which certainly adds to the subject of my book, but one should be aware that there are also very good metrics measuring the various activities which fall under Human Capital management: recruitment efficiency, training efficiency, absenteeism, internal communication levels, personnel costs to revenue ratio, average values per employee for the following indicators: profit, revenue, remuneration, fixed to variable pay ratio, fluctuation of manpower and fluctuation costs, talent retention, level of internal promotions, engagement, payslip costs, etc. Let us not forget that such indicators should be used at the macroeconomic level. Claims are often heard that labor productivity in Bulgaria is much lower than that in developed economies, but no procedures are ever proposed to calculate this productivity, nor do we know anything about the specific steps taken to improve it. When I was writing my book Remuneration Management, I decided not to complicate the matter too much, in the hope that whenever I had the opportunity in the future I could come back and develop further the part on the indicators (metrics) of success. Obviously, here I will attempt to merely lift the curtain, moreover I have to admit that I myself am still in the process of studying and improving my understanding of the subject, and the more I explore HC metrics, the more the scope broadens and my questions become more profound. Businesses pursue financial goals which get monitored by investors or the leaders of the companies themselves whenever decisions are taken for investment or change of business goals. HC investments (staff costs) appear as only a several numbers in a company’s financial statement, but the productivity resulting from them and how they can affect the return on investment are all questions whose answers may actually improve the company’s financial performance. True, we don’t yet have the standardized metrics needed to measure how far HR management has achieved a certain level of success. It is also true that the accurate interpretation of data requires the use of at least several indicators, which, however, should not prevent us from seeking and applying the best practices available. The financial downturn has lead to a minor increase, and often even to decline in revenue and profit, which makes analysts in developed economies opt for cost optimization instead. In Bulgaria, the term ‘cost optimization’ is used to conceal actions taken to actually cut costs. A material of the Human Capital Management Institute quotes an article by Tom Davenport (Davenport, Harris & Shapiro, 2010) published in Harvard Business Review, where the authors believe that leading companies such as Starbucks, Limited Brands, Best Buy and others are well aware of the profits which may result from improved employee engagement or talent retention. The final formula according to which the impact of human capital’s productivity is calculated looks logical, although somewhat complicated for the Bulgarian situation. I do not intend, though, to present here the ideas behind a Human Capital Financial Statement, which anyone interested can see discussed in detail at http://www.hcminst.com/. Let me just add that throughout my career as a consultant I have often observed my clients’ growing interest when, in the course of a presentation, we come to the topic of Return on Investment in Human Capital. This interest is usually triggered by the discussion of both company data over a certain period, most often several years, and comparisons between the company in question and rivals from Bulgaria and abroad. In other words, the use of HR management (HRM) performance indicators in developed economies has come to be seen as a key tool in trend analysis and forecasting, providing information needed in strategic decision making and process optimization. HRM experts use the results from the analysis to take action aimed at improving effectiveness, HC return on investment, talent loss risk avoidance, and optimization of the processes used in HC management. It is hardly a secret that HCM performance indicators are not particularly popular in Bulgaria, the main reasons, in my opinion, being the following: the difficulty in selecting indicators, the laborious process of data collection and analysis, the challenging task of finding rival data for comparison, and in many cases the fact that HC managers simply dislike numbers. To prove that all of the above (except for the last one) are not so hard to deal with, I decided to use an HC ROI indicator for four companies based on publicly available information mostly taken from their annual financial statements. (By way of digression, let me recommend here a web based provider of „hard-to-get information on more than 80 emerging markets “ – ISI Emerging Markets). 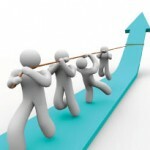 Human Capital Return on Investment – HC ROI. HC ROI is an indicator in which a single figure combines the company’s financial performance (profit and loss) with the amount of personnel costs (investment). It reveals how revenues, cost control and the efficiency of HCM policies affect each other. I have come across several HC ROI formulae where higher values stand for higher return, i.e. the company has gained more than the investment it has made in remuneration and social security contributions. Using the example of Deloitte Bulgaria, I left the companies’ financial revenues and expenditures out, based on the assumption that HC have no direct impact on these. The result shows the profit before tax gained by the company per 1 BGN invested in remuneration. Personnel costs include all costs paid by the employer as cash or in-kind income: salaries, bonuses, overtime, rewards, benefits, social security contributions. In the four publications below I will present annual data used to calculate HC ROI for the four companies in question for the period 2007/2011. Chart one shows the information about Kamenitza. The analysis is available here. Next comes the Zagorka chart. To this, we add the Carlsberg Bulgaria chart. And finally, the Bolyarka VT chart. As a follow-up on the article on Human Capital Return on Investment, below I have presented the Kamenitza chart. 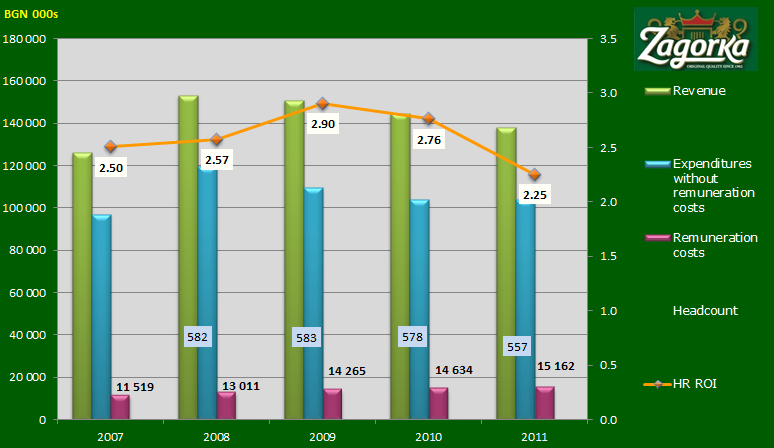 The revenue chart (in green) reveals year-to-year variations, reaching a peak in 2011, with an overall upward trend. Total expenditures without remuneration costs (in blue) tend to follow the trend at a relatively stable pace except in 2007, when the company generated substantial income through sale of fixed assets. This means that Kamenitza’s managers are following a cost control policy with expenses tied to revenues. If we now look at remuneration costs (in purple), we can see two sharp increases in 2008 and 2009. 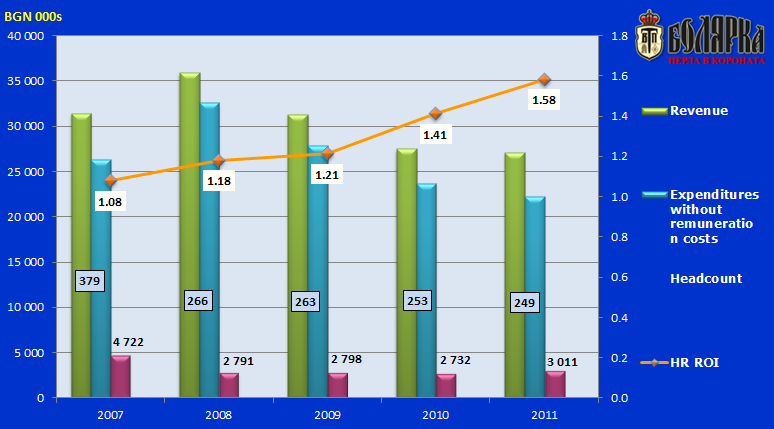 The 2008 increase is combined with a substantial growth in headcount (the numbers in the blue cells). 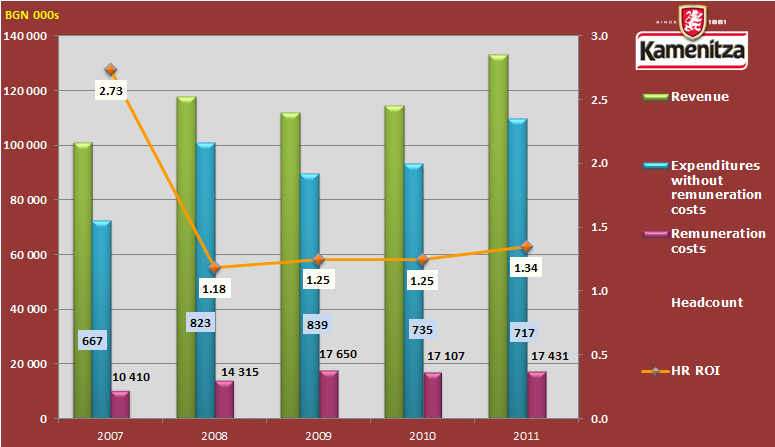 The 2009 increase is no good news as it doesn’t lead to any increase in revenue. The average remuneration costs per employee (not shown on chart) have been growing at a regular pace from BGN 1 301 for 2007 to BGN 2 026 for 2011. Based on numbers alone, and without any knowledge of the company’s employee incentive systems, one can assume that in the period 2009-2011 the company has been encouraging higher performance among its employees, leading to an increase in revenue. With respect to HC ROI (the orange curve), following the rule that any number greater than one is an achievement and given the HC ROI uptrend, one may conclude that the company is doing fine, but whether this is indeed the case will depend on the management’s opinion and on results from comparisons with rivals. As part of the article on Human Capital Return on Investment here we continue the analysis of the Bulgarian brewing industry with information about Zagorka. The data show much higher operating income (in green) with fluctuations and an overall downtrend. Despite this, however, even the lowest income level in 2011 is above Kamenitza’s performance. The trend is obviously one of falling income, which, together with the overall decline in the consumption of beer in Bulgaria indicates a somewhat alarming trend for the company. The positive impression comes from the wide margin between income and expenses (in blue and purple, respectively), which enables the company to retain stable profits throughout the period (not shown on chart). This, together with the lack of abrupt changes in remuneration costs (in purple) and a relatively stable headcount (the numbers in the blue cells) results in a remarkable HC ROI. It would be interesting to compare this information with industry data for companies operating on markets other than Bulgaria. Should such data be available, it would be advisable to calculate the average revenues generated by the sales force to see their efficiency and set guidelines for changes in the organization of operations and focus on the building of new sales skills. These findings can be further elaborated through comparison with rival data. And one more thing as a proof that indicators are not necessarily unequivocal and most often when data is analyzed several different metrics need to be combined with a good knowledge of changes in the respective business: HC ROI for 2011 is at its lowest rate for the period, while the average salary (about BGN 2 300, not shown on chart) is at its highest. I assume there are two reasons for this: firstly, a gradual shrinking of workforce throughout the year, and secondly, a decline in the number of lower paid employees which, together with the decrease in revenue, results in a lower HC ROI. Or could this be an example where job cuts do not necessarily translate into cost optimization? The HC ROI analysis of the key players in Bulgaria’s brewing industry continues with information about Carlsberg Bulgaria. This chart is part of the article on Human Capital Return on Investment. The first thing that strikes on the chart is the steady downtrend in revenues after 2008. This rather unflattering picture is further worsened by a steady decline in profits (not shown on chart), with the exception of 2010 when an increase in the margin between revenues and expenses results in an increase in HC ROI to 1.87, this being the highest level for the entire period. Remuneration costs keep going up slowly, even where headcount and revenues go down. Unfortunately, there is no indication whether remunerations are tied to the company’s revenues and profits. 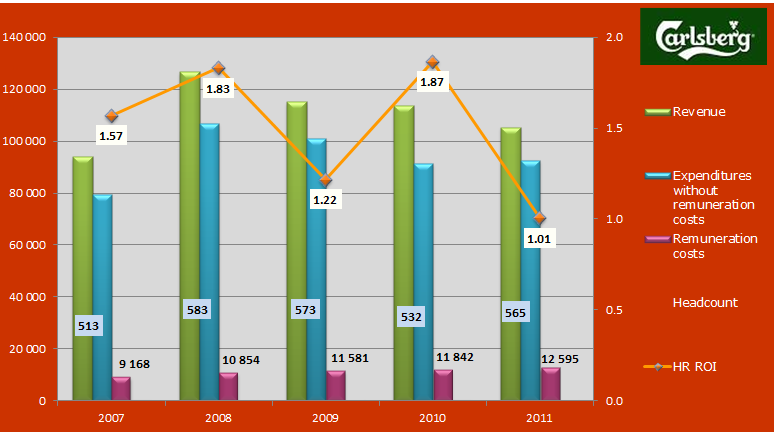 HC ROI fluctuates alarmingly, hitting the bottom in 2011. The chart reveals that at the end of 2011, Carlsberg’s managers were faced with the challenge of taking serious decisions aimed at boosting revenues, cost optimization and HC optimization. I very much hope that the analysis has been helpful in identifying the measures which the company has to take to improve workforce efficiency and use the full potential of its employees to boost performance. Whether this has actually been the case, remains to be seen after the publication of the 2012 results. Something is definitely true in this company’s logo: A jewel in the crown. Bolyarka has the lowest sales revenues from all four companies discussed here. Remarkably, however, despite the drop, Bolyarka has its profit steadily on the rise (not shown on chart). The decrease in revenues results in decrease in expenses, but with personnel costs and headcount remaining stable, a steadily growing HC ROI is observed. Obviously, Bolyarka’s managers are quite good in making the best possible use of their workforce’s capacity, thus showing the most stable uptrend in profit and HC ROI. It should be noted that of all four companies, Bolyarka has the lowest average remuneration costs per employee. In my view, this is the result of the status quo on the regional labor market and the workforce structure. I will certainly continue to keep track of the company’s development. “Remuneration Management” is my first book which is a practical guide for remuneration management in organizations. The book is a contemporary interpretation of trends in remuneration theories viewed through the lens of 15 years’ experience in the area of human resources. The book covers the main elements of remuneration, their nature, manner and method of formation, business processes that could be supported, and different approaches and technique. I would like to turn with gratitude to academic authors writing in the field of remuneration, and to assure that this text is not intended to usurp the authorship of their scientific work; it is just evidence of the usage of their theories in practice. I would like to thank to Petya and Lori my lovely family, my friends and especially to Tanya Boyadjieva, for their support and patience, and to the publisher Ciela. Presentation of the book “Remuneration Management”, March 1, 2012, a book store Helicon Vitosha Sofia. I expect you on 1 March 2012 at 18.30 at the bookstore Helicon Vitosha Sofia. Tanya Boyadjieva certified human resources management consultant, author of the preface of the book. Welcome to my space for sharing experiences, comments and ideas on the management of human resources.